Unite continues to gather evidence via our on-line survey on how equal rotations are affecting our members. A review of equal time rotations is part of the OCA agreement and we are encouraging members and offshore workers to complete the survey. The North Sea oil workforce suffered another blow this week (May 25) after Shell announced it would cut 475 jobs in the UK and Ireland.The latest announcement is part of a wider raft of Shell job losses worldwide, totalling more than 2,000. In the last two years alone, Shell has now shed in total more than 1,000 jobs in the UK and Ireland, in what it says is a response to the downturn in the price of oil. The latest jobs cull also comes in the wake of the oil giant’s £36bn merger with oil and gas exploration group BG. Shell vice president for UK and Ireland Paul Goodfellow blamed the price of oil for the job cuts, saying that market conditions “remained challenging” and that the company had to operate in an environment in which oil prices would be “lower for longer”. But Unite has hit out against this logic, arguing that the cuts are instead part of oil companies’ race to the bottom on terms and conditions which will decimate the viability of the North Sea oil industry in the future. “Unite does not accept that the job losses reported are a direct consequence of market conditions,” said Unite’s John Boland. “There is a real attempt to use this as an opportunity to cut jobs and attack workers’ pay and working conditions. “We will not allow this attempt at smoke and mirrors to detract from what is, in actual fact, a race to the bottom on costs, but with the added risk of another health and safety catastrophe,” he added. Shell’s job losses are only the tip of the iceberg – the North Sea workforce has been decimated over the last year, with 150 jobs going every day since the downturn in the price of oil, bringing the total number of offshore job losses to an astounding 65,000. The latest announcement from Shell further underscores Unite’s call for the governments in Edinburgh and at Westminster to do more to save this vital industry beginning by convening a cross-sector oil and gas summit to plan for the industry’s survival and growth. As UNITElive reported earlier this year, Unite, joined the RMT, the GMB, Balpa, and Nautilus in a Scottish TUC-coordinated press conference to speak as one voice representing hundreds of thousands of oil workers. “The Oil and Gas Confederation (OGC), of which we are members, has called time and again for an oil and gas sector summit to be convened urgently,” Boland noted. Unite has criticised the offshore oil and gas companies for using the downturn to impose of regressive working practices across the North Sea. The industry moved quickly to cut pay and holiday entitlement with proper consultation following a sharp drop in the price of oil. “Oil companies must drop the attrition strategy – stop cutting jobs and attacking workers’ terms and conditions,” Boland added. “It is time to take stock because this industry is heading to a situation whereby it will have lost the very skilled and experienced workers it will need to deal with the upturn. Boland’s point was also made earlier this year by industry certification body DNV GL, which in its annual report, warned against short-term, knee-jerk cuts. “As an industry, we have taken quick, cost-cutting action, which has been particularly apparent through a raft of major job cuts over the past 12 months, and further short-term measures are expected, despite concerns over the skills drain,” said DNV GL oil and gas regional director for the UK Hari Vamadevan upon the release of the report. Unite regional officer Tommy Campbell concurred. If you are employed in the UKCS Oil & Gas sector , Join Unite the Union online today and get protected at work. We have already given a lot of ground because we understand that with a low oil price the companies had to make changes to maintain profitability. Very few if any of us wanted to go to a 3 week work cycle but we did reluctantly because we are reasonable. A level 2 Maintenance Tech now earns 6.9% less per offshore day due to the changes to holiday pay which we accepted because we are reasonable. A Level 2 Maintenance Tech earns 24.7% less per training day which we accepted because we are reasonable. This is on top of cuts to sick pay, health cover, additional day rates, etc. We all have less time at home now and are compensated less for each day. To willingly give any more ground is not an option to the guys on here. What Wood Group have suggested would mean a 30% pay cut to the worst affected without taking in to account further cuts to sick pay and training rates etc. This is not reasonable! Nobody here wants to lose their job or to take industrial action but we need to make it known that we are willing to take this stand if pushed. This is our only opportunity to stay strong and say no, not just for us but for the whole of the North Sea! Unite members have gone into dispute with Wood Group to protect their Terms & Conditions and they are prepared to take Industrial Action if these proposed cuts are not withdrawn. 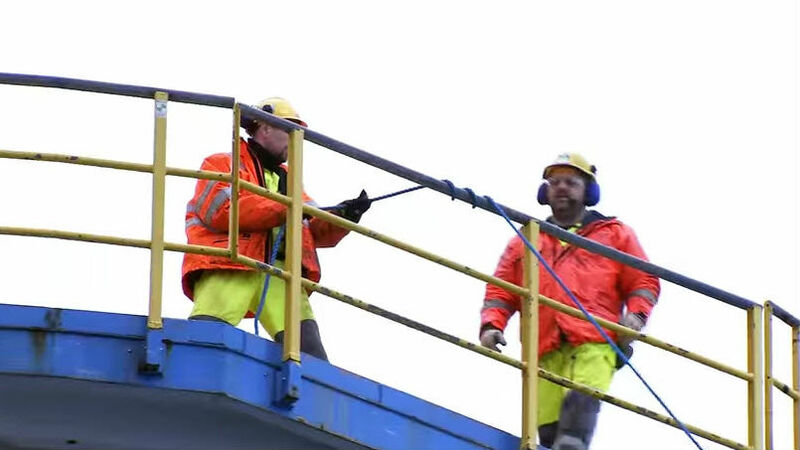 Strike action on North Sea oil platforms moved a step closer today as talks over pay, proposed cuts and changes to working conditions by the Wood Group broke down. Wood Group is proposing pay cuts of up to 22%, though once cuts to other allowances are added this rises to a 30% cut. Unite, the leading union for offshore workers, said it will now prepare to ballot several hundred members working for Wood Group on eight of Shell’s North Sea oil and gas platforms. The dispute – raised under the OCA (Offshore Contractors’ Association) agreement – was confirmed after union representatives met Wood Group management today (Friday 27 May). The proposed pay cut comes on top of cuts to holiday pay and training rates, while recent changes have also seen workers move to a three-week working cycle. Also a level 2 Maintenance Technician now earns 6.9 per cent less per offshore day due to the changes to holiday pay. Having been unable to convince the employers to think again on the implications of the intended cutbacks, Unite members through their shop stewards have now formally rejected the new proposals put to them today. In recent months union leaders have raised concerns over continuing reductions in the workforce coupled with more demanding shift patterns in a notoriously dangerous industry. Unite has accused bosses of opportunistic cuts to pay, and terms and conditions which make it impossible for rigorous health and safety standards to be maintained industry-wide. John Boland Unite regional officer said: “Our members are simply not being heard by Wood Group. They are deeply worried and frustrated and feel that they have no other option now but to consider strike action. “Nobody here wants to take industrial action but Wood Group is being unreasonable – pay cuts of up to 30 per cent are totally unjustified and we won’t stand for it. “Our members have already given a lot of ground because we understand that with a low oil price the companies had to make changes to maintain profitability. “For the benefit of the North Sea as a whole we must not to roll over again. This is our only opportunity to stay strong and say no, not just for us but for the whole of the North Sea. “We have done our best to find a negotiated way forward through discussion. We well understand the pressures the sector is under, but workers are being stretched beyond the limit in what is one of the most dangerous working environments on the planet. “Unite will defend and protect our members every step of the way. Sadly, we are being forced to raise a dispute and proceed to a ballot on industrial action because members have simply had enough of not being listened to. “There is real despair in the workforce and a feeling that employers are responding to the current downturn by slashing terms and conditions. Unite Scotland has been calling on the industry to redouble its efforts to tackle its challenges by properly engaging with workers and their trade unions, through a summit involving all stakeholders. For more information please contact: Alex Flynn Unite head of media and campaigns on 020 3371 2066 or 07967 665869 or Unite regional officer John Boland, on 07918 630 435. In March nearly 95 per cent of union members voted in a consultative ballot in favour of proceeding to an industrial action ballot.